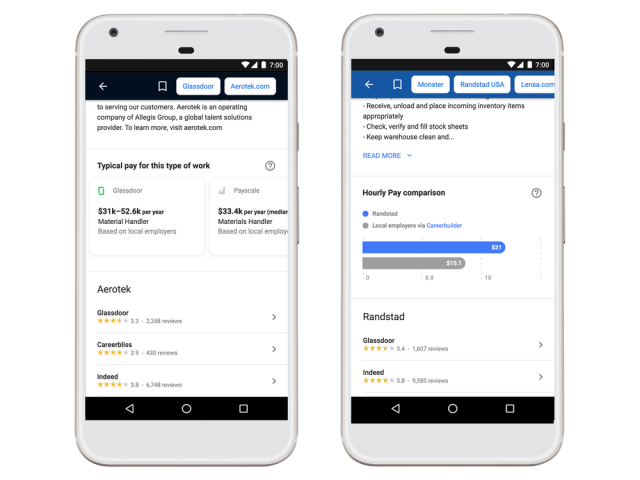 As part of its Google for Jobs initiative, earlier this year Google introduced a new job search tool to help users better understand a prospective employer or how long their new commute might take. Today, based on feedback that Google has received, the job search tool gets an update that makes it a lot more useful. Among the new features are a salary estimator and improved location filter. Google says that the salary information is actually missing from the vast majority (85 percent) of job postings in the US, so, to make up for this, it's added a salary range based on metrics like location and job title. The salary estimates come from LinkedIn, Glassdoor, PayScale and other such sources, where either employees or employers are likely to share such information publicly. What is more, Google says that, when there is a salary listed in the posting, it will also tell you how it compares to the estimated ranges, if they are available, so you know how it compares to what other folks are getting paid. When you find a job that interests you, Google will now let you choose where to apply for it. You can also now save the job straight from search and have a list available on all your devices. The location feature was updated so that you can filter jobs based on a distance you prefer from a location of your choosing. You can also see jobs from "anywhere," if you so desire. How do you access this job search tool? Well, it's simple: you only need to search for what you are interested in (like "java developer jobs") and all the available options will be displayed in the results.